Each of the 23 or 25 signature lines is a numbered adhesive label. Each patient completes the next available line and removes the number to the left of the name. When the patient signs in, their information is transferred through a carbonless sheet to a "record sheet" on the back of the form. The back sheet on these forms allows you to keep a record of all patients check in for that day. 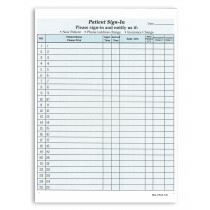 The office attendant then peels off the label from the medical office sign in sheet and attaches it to the patient's file to keep a history of his/her visit. No information is visible to other patients which is what makes these forms HIPAA Compliant.